Lost‘s Greg Yaitanes will direct and executive produce Spike TV‘s upcoming Red Mars TV series. Yaitanes has also worked on series including: Damages, Grey’s Anatomy, Ray Donovan, Heroes, House, and Banshee. While not cancelled, Banshee, which Yaitanes EPs, will end after its fourth season, which premieres on Cinemax, April 1st. 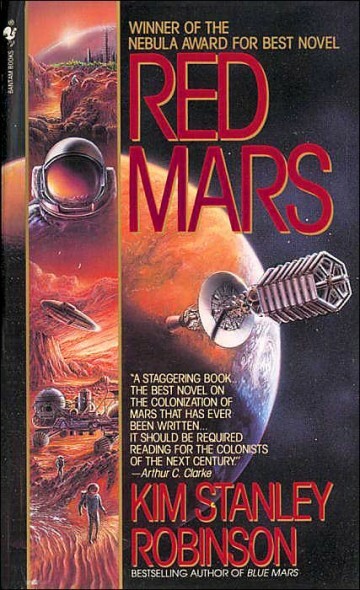 Red Mars is a TV series adaptation of Kim Stanley Robinson’s Mars trilogy (which also includes Blue Mars and Green Mars). Peter Noah is executive producing with Skydance’s David Ellison, Dana Goldberg and Marcy Ross. J. Michael Straczynski is also executive producing along with Vince Gerardis. New York, NY, March 14, 2016 — Emmy®-award winning television and film director Greg Yaitanes will serve as Director and Executive Producer for Spike’s highly-anticipated scripted series “Red Mars,” it was jointly announced today by Sharon Levy, Executive Vice President, Original Series at Spike TV and Marcy Ross, President of Skydance Television. Yaitanes’ extensive resume includes many of the most popular and critically-acclaimed television series over the last decade, including “Lost,” “Damages,” “Grey’s Anatomy,” “Ray Donovan,” “Heroes,” “House,” and “Banshee.” He is repped by Joe Cohen and Tiffany Ward at CAA. One of the most tech-savvy directors in the industry, Yaitanes’ foresight and technological entrepreneurship has made him a respected name in Silicon Valley. Yaitanes was an original investor in Twitter and early investor in Pinterest, Square, and Foursquare. Spike is bringing Kim Stanley Robinson’s award-winning “Mars Trilogy” to television with Skydance Television serving as the studio on the original one-hour scripted series, titled “Red Mars.” The books, “Red Mars,” “Green Mars,” and “Blue Mars,” which chronicle mankind’s colonization and transformation of the red planet, have been adapted in 21 languages and are regarded as the best novels ever written on the subject. “Red Mars” goes into production this summer and will consist of ten one-hour episodes, to debut in 2017. Peter Noah (“Kingdom,” ”Scandal,” “Tyrant,” “The Firm,” “West Wing”) serves as Executive Producer for “Red Mars” along with Skydance’s Ellison, Dana Goldberg and Marcy Ross (Skydance’s 2015 feature films were “Mission: Impossible – Rogue Nation” and “Terminator Genisys” and its current television slate includes Emmy-nominated “Grace and Frankie” on Netflix). J. Michael Straczynski is Executive Producer along with Vince Gerardis. Levy, Ted Gold, Senior Vice President, Scripted Original Series, Justin Lacob, Vice President, Original Series, and Lauren Ruggiero, Senior Director, Scripted Programming will oversee the project for Spike. Vlad Wolynetz will serve as Co-Executive Producer. Spike TV debuted its first scripted event series in eight years, “Tut,” last July to strong ratings. Skydance is a diversified media company founded by David Ellison in 2010 to create elevated, event-level entertainment for global audiences. The Company brings to life stories of immersive worlds across platforms, including feature film, television, gaming and digital. Among Skydance Media’s commercially and critically successful feature films are Mission: Impossible – Rogue Nation, Terminator Genisys, World War Z, Jack Reacher, G.I. Joe: Retaliation, Mission: Impossible – Ghost Protocol, Star Trek Into Darkness and True Grit. Its 2015 feature films, Mission: Impossible – Rogue Nation and Terminator Genisys, together grossed over $1 billion at the worldwide box office. Skydance’s feature film slate includes Star Trek Beyond on July 22, 2016, Jack Reacher: Never Go Back on October 21, 2016 and Geostorm on January 13, 2017. Skydance Media’s rapidly growing and critically acclaimed television division launched in 2013 and its first two projects went straight-to-series: the Emmy-winning Manhattan and Emmy-nominated Grace and Frankie. The Company’s television slate now features a variety of projects across a number of networks, including both Grace and Frankie and Altered Carbon on Netflix, Red Mars on Spike TV and Jack Ryan on Amazon. Spike TV is available in 91.4 million homes and is a division of Viacom Media Networks. A unit of Viacom (NASDAQ: VIA, VIAB), Viacom Media Networks is one of the world’s leading creators of programming and content across all media platforms. Spike TV’s Internet address is www.spike.com. What do you think? Have you read the Mars Trilogy? Who would you like to see cast in the Red Mars TV show? Tell us! More about: Red Mars, Red Mars: canceled or renewed?, Spike TV TV shows: canceled or renewed?